David Michôd (/ˈmɪʃoʊ/; born 30 November 1972) is an Australian film director, screenwriter, producer and actor. He is best known for directing the critically acclaimed 2010 film Animal Kingdom and the 2014 film The Rover. He also co-wrote Hesher. Michôd was educated at Sydney Grammar School before moving to Melbourne to study arts at the University of Melbourne. After working for the Victorian Department of Education he decided to attend film school while in his mid-20s. He later served as editor of Inside Film magazine, serving in the role between 2003 and 2006. Michôd began his directing career in short films, with Ezra White, LL.B. in 2006 being one of the first to make an impact. In 2007 Michôd's next short film Crossbow, a coming-of-age drama was premiered at Venice Film Festival and received positive response from critics. After that the film compete at number of film festivals and earned good reviews. The film also screened at Sundance Film Festival and won Australian Film Institute Award for Best Screenplay in a Short Film. Next year, in 2008 Michod directed another short film Netherland Dwarf, which was also screened at Sundance Film Festival and Berlin International Film Festival and earned positive reviews from critics. The same year, Michod co-directed Solo, a documentary film with Jennifer Peedom. It features the journey of Australian adventurer Andrew McAuley who went on a solo kayak crossing from Tasmania to New Zealand. The documentary received positive response on its release, Empire Online gave film five stars and said "As a tribute to a man – and man's – insatiable search for adventure, it's unforgettable." In 2009, Michod directed Inside the Square, a 30-minute behind-the-scene documentary on the making of 2008 film The Square directed by Nash Edgerton. In 2010 his debut feature film, Animal Kingdom was released. The film received overwhelming critical acclaim and received several awards and nominations. In his review of the film for Time Out, Dave Calhoun compared him to Martin Scorsese that "He brings a big dose of Scorsese to Melbourne in telling of a fictional crime family." J.R. Jones of Chicago Reader praised him by saying that "Writer-director David Michôd creates a densely textured moral universe that makes good on his metaphoric title." While Bill Goodykoontz in his review for The Arizona Republic said that "The naturalistic style Michod employs adds to the sense of dread. Is there no way out of this existence? To whom would it appeal?" The film became the third highest grossing Australian film at the Australian box office for 2010, with a worldwide box office gross of US$5,775,563. Michod's next film, a futuristic Western entitled The Rover with Guy Pearce and Robert Pattinson. Filming began on 29 January 2013 in Southern Flinders Ranges, Australia and ended on 16 March 2013 in Marree, north of Adelaide, Australia. The film had its premiere out of competition in Midnight screening at 2014 Cannes Film Festival on 18 May 2014. Todd McCarthy of The Hollywood Reporter, said that "David Michod’s follow-up to his internationally successful debut with the Melbourne gangster saga Animal Kingdom is equally murderous but more pared down to basics, as desperate men enact a survival-of-the-meanest scenario in an economically gutted world reduced to Old West outlaw behavior." The film had a limited release on 13 June 2014 in New York City and Los Angeles before expanding wide on 20 June 2014 in the United States. On 14 April 2014, it was announced that Michôd will write and direct The Operators, based on the 2011 best seller of the same name by Michael Hastings. The film will be jointly produced by Plan B Productions, New Regency and RatPac Entertainment, with Brad Pitt attached to star. It was later retitled as War Machine. In the 2012 Sight & Sound Poll of the greatest films of all time Michôd chose Apocalypse Now, Alien, The Assassination of Jesse James by the Coward Robert Ford, Funny Games, Magnolia, Network, Sunset Blvd., The Thin Red Line, Taxi Driver and Werckmeister Harmonies as his top ten picks. 2015: Flesh and Bone First Episode: "Bulling Through"
This chart lists every actor who has appeared in more than one film directed by Michod. Mirrah Foulkes is Michod's most prolific collaborator, having appeared in four of his films. David Michôd was honored along with Joel Edgerton and Teresa Palmer for their work in international roles with the coveted 2011 Australians in Film Breakthrough Award. ↑ "Director David Michôd introduces the Animal Kingdom trailer". Retrieved 7 December 2014. ↑ "DAVID MICHOD". Retrieved 20 April 2013. 1 2 3 Chai, Paul (20 January 2010). "Director to Watch: David Michod". Variety. Retrieved 2 February 2010. ↑ "David Michôd: Q&A with the Animal Kingdom director". Retrieved 20 April 2013. 1 2 Maddox, Garry (25 May 2010). "Killer crims take Sundance by storm". Sydney Morning Herald. Retrieved 8 June 2010. 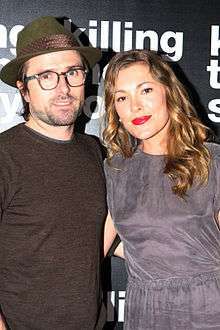 ↑ "Directors Jennifer Peedom & David Michôd". Vancouver International Mountain Film Festival. Retrieved 2 February 2010. ↑ "5 Key Directors of New Australian Cinema As Andrew Dominik's 'Killing Them Softly' Hits Theaters". Retrieved 20 April 2013. 1 2 "Angie Fielder Co-Founder, Aquarius Films". Retrieved 20 April 2013. ↑ "Crossbow A STYLISH AND MEDITATIVE FILM CENTERING ON THE UNHAPPY LIFE OF A NEGLECTED TEEN, TOLD FROM THE PERSPECTIVE OF HIS NEIGHBOR WHO ATTEMPTS TO MAKE SENSE OF HIM.". Retrieved 20 April 2013. ↑ "Crossbow A STYLISH AND MEDITATIVE FILM CENTERING ON THE UNHAPPY LIFE OF A NEGLECTED TEEN, TOLD FROM THE PERSPECTIVE OF HIS NEIGHBOR WHO ATTEMPTS TO MAKE SENSE OF HIM.". Retrieved 15 April 2013. ↑ "AACTA 2007 Winners & Nominees". Retrieved 20 April 2013. ↑ "NETHERLAND DWARF GETS ANOTHER GONG". Retrieved 20 April 2013. ↑ "TGIFilm: Netherland Dwarf". Retrieved 20 April 2013. ↑ "DAVID MICHOD'S SWEET AND SAD STAMPY". Retrieved 20 April 2013. ↑ "Solitary Endeavour on the Southern Ocean". Retrieved 20 April 2013. ↑ "Ratemymeds: Solo". Retrieved 20 April 2013. ↑ "Adventurer Andrew McAuley attempts to kayak from Australia to New Zealand". empireonline.com. Retrieved 20 April 2013. ↑ "Writer/Director – David Michod". Retrieved 20 April 2013. ↑ "ANIMAL KINGDOM: A MASTERPIECE OF CREEPING DREAD". Retrieved 20 April 2013. ↑ Kung, Michelle (31 January 2010). "Sundance 2010: "Animal Kingdom" Director David Michôd on the Origins of his Film". Wall Street Journal. Retrieved 2 February 2010. ↑ Turan, Kenneth (27 January 2010). "Young directors Nicole Holofcener and David Michod have a bond down deep". Los Angeles Times. Retrieved 2 February 2010. ↑ "Top 100 Most Anticipated Films of 2010: David Michod's Animal Kingdom". Internet Movie Database. 13 January 2010. Retrieved 2 February 2010. ↑ Calhoun, David (22 February 2011). "Animal Kingdom (15)". Time Out. Retrieved 14 April 2014. ↑ "Animal Kingdom". Chicago Reader. Retrieved 14 April 2014. ↑ "'Animal Kingdom,' 4.5 stars". The Arizona Republic. Retrieved 14 April 2014. ↑ "Animal Kingdom (2010) – International Box Office Results". Box Office Mojo. Retrieved 14 April 2014. ↑ "Robert Pattinson gets Down Under and dirty with Guy Pearce in 'The Rover' – FIRST LOOK". Retrieved 20 April 2013. ↑ "Pattinson's new role shows he's come a long way since Twilight". smh.com.au. Retrieved 20 April 2013. ↑ "Hollywood comes to the Outback". adelaidenow.com.au. Retrieved 20 April 2013. ↑ "Robert Pattinson far from Twilight filming new movie The Rover in Outback Australia". couriermail.com.au. Retrieved 20 April 2013. ↑ "'Foxcatcher,' 'Map To The Stars,' 'The Rover,' 'The Search' And New Jean-Luc Godard Lead Cannes 2014 Line-Up". Retrieved 17 April 2014. ↑ "2014 Cannes Film Festival line-up" (PDF). Retrieved 8 May 2014. ↑ "The Rover: Cannes Review". Retrieved 19 May 2014. ↑ "A24 Dates 'The Rover' With Robert Pattinson For June 13, Keira Knightley's 'Laggies' For September 26". Retrieved 17 March 2014. ↑ "A24 Films". Retrieved 17 March 2014. ↑ "'The Rover' Teaser Trailer – Robert Pattinson and Guy Pearce Trek Across the Australian Outback". Retrieved 17 March 2014. ↑ "'Animal Kingdom' Filmmaker Boards Brad Pitt's Adaptation of Michael Hastings' 'The Operator'". Retrieved 12 April 2014. ↑ "David Michod to Direct, Write Brad Pitt's 'The Operators'". Retrieved 12 April 2014. ↑ British Film Institute (2012). "David Michôd Sight & Sound 2012". Explore.bfi.org.uk. Retrieved 2014-05-01. ↑ "'Enlightened' Season Two Will Premiere Sunday, January 13 on HBO". Retrieved 20 April 2013. ↑ "ENLIGHTENED". Retrieved 20 April 2013. 1 2 3 "David Michod". Retrieved 20 April 2013. 1 2 3 4 "Spider – Australian Short Film". Retrieved 20 April 2013. ↑ "Short Film of the Day: I Love Sarah Jane". Retrieved 20 April 2013. ↑ "Watch Nash Edgerton's Twisted Short Film BEAR Starring Teresa Palmer". Retrieved 20 April 2013. ↑ "Eugénie Sandler P.I: episode guide". Retrieved 20 April 2013. ↑ "Little Deaths (2010)". Retrieved 20 April 2013. ↑ "Spotlighting First Nominees". Retrieved 20 April 2013. ↑ "FILM DETAIL". Retrieved 20 April 2013. ↑ "TROPFEST 2000: THE WINNERS, THE NIGHT". Retrieved 26 April 2013. ↑ "MELBOURNE INTERNATIONAL FILM FESTIVAL:AUSTRALIA ALL GENRES". Retrieved 20 April 2013. ↑ "AACTA 2007 Winners & Nominees". Retrieved 2 April 2013. ↑ "THE FITZ Best Short Film Awards of 2007". Retrieved 20 April 2013. ↑ "Winners of the 17th annual Flickerfest Awards announced". Retrieved 15 April 2013. ↑ "Flickerfest: Celebrating 20 Years". Retrieved 20 April 2013. ↑ "Edgerton, Michod wins at Flickerfest". Retrieved 18 April 2013. ↑ "Flickerfest getting closer". Retrieved 20 April 2013. ↑ "Shorts Monthly: "The Witness" Captivates Audience and Jury at Aspen Shortsfest 2009". Retrieved 18 April 2013. ↑ "Aspen shortsfest" (PDF). Retrieved 20 April 2013. ↑ "2009 Film Award Winners". Retrieved 20 April 2013. 1 2 3 4 "solo director". Retrieved 20 April 2013. ↑ "winners". Retrieved 20 April 2013. ↑ "Australian Directors Guild unveils 2010 award winners". Retrieved 26 April 2013. 1 2 "Michod king of directors' kingdom". Retrieved 26 April 2013. ↑ "2010 Nominations" (PDF). International Press Academy. Retrieved 20 April 2013. 1 2 "WINNERS OF THE FCCA AWARDS FOR AUSTRALIA FILM FROM 2000 TO 2011.". Retrieved 26 April 2013. 1 2 "43rd Annual AWGIE Awards – Winners List". Retrieved 26 April 2013. ↑ "2010 Sundance Film Festival Announces Awards" (PDF). sundance.org. 30 January 2010. Retrieved 20 April 2013. ↑ "21st STOCKHOLM FILM FESTIVAL EMBRACES INDIE TALENT ON THE RISE". Retrieved 26 April 2013. 1 2 "2010 Kodak Inside Film Awards Sydney Nominees". ifawards.com. Retrieved 30 January 2011. "2010 Kodak Inside Film Awards Sydney Nominees". ifawards.com. Retrieved 20 April 2013. ↑ "Chicago Film Critics Awards – 2008–2010". Chicago Film Critics Association. Retrieved 20 April 2013. 1 2 "AFI Award Winners and Nominees". afi.org.au. Retrieved 20 April 2013. ↑ "AACTA". Retrieved 26 April 2013. ↑ "Sydney Film Festival announces 2014 program and guest list". Retrieved 21 May 2014. ↑ "4TH AACTA AWARDS NOMINEES" (PDF). Retrieved 3 December 2014. ↑ "AFCA Award Nominations". Retrieved 8 January 2015. Wikimedia Commons has media related to David Michôd.